We are Bario-Neal Jewelry and we are excited to announce the opening of our New York City showroom in lower manhattan. Bario-Neal is committed to environmental responsibility, ethical sourcing, and marriage equality. Our work is handmade in Philly with recycled metals and responsibly-sourced gemstones. We are also happy to work with your heirloom stones or recycle your precious metals in our bands. The new location offers our custom design services and showcases Bario-Neal’s collections. It’s important for us to be able to work with our customers on a personal level as they search for the right wedding band, engagement ring, or special pair of earrings. With our new space, we look forward to being able to better serve (& get to know) our New York-based customers. The showroom is only by appointment, but we are having an opening party! Stop by and check it out November 7th from 5-8pm, at 195 Chrystie St., #900A. Editor's Note: Anna and Page sent me a whole bunch of images to choose from for this post. Rings, earrings, necklaces, bracelets (yes, they make all those things, too!). 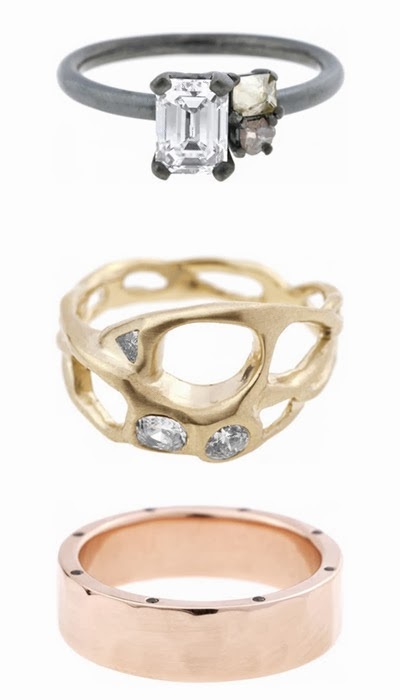 But it's the RINGS RINGS RINGS RINGS RINGS RINGS RINGS that blow me away every time -- both Bario-Neal's custom work (custom designs begin at $500, see three examples pictured at top) and the engagement rings + bands from their current collection (rings pictured are priced between $255-4400). I love Bario-Neal! Prettiest rings out there. That's where the man is getting his ring. The most beautiful rings from the best -- and kindest -- designers around. I have mine. Wow!!! Great post. Thanks for collecting wedding rings.I love it so hard. WHOA. Love these designs and the company's background. Uuggghhhk. I hate how much I love Bario - Neal. My wedding band from them is amazing and I always get compliments on it. But every time I see any of their rings I want ALL OF THEM. I want to have wedding bands and rings on every finger. I become a crazy dragon and want to hoard all of bario - Neal jewelry in a cave. Good thing I live on the opposite coast of nyc and can easily avoid their showroom.